Martinique is one of the shining jewels of the French Caribbean and is part of the Windward Islands in the Lesser Antilles. It has flawless beaches with white sand on the south coast and black sand on the north coast. Enjoy swimming and snorkeling among coral reefs or visit pretty fishing villages, hot springs, lush rainforests and rugged peaks. 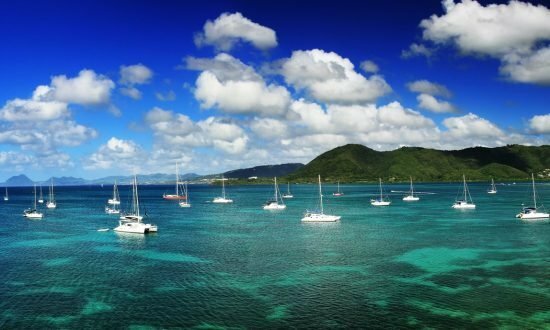 Get in touch with our team today to discover Martinique by yacht charter. The capital, Fort-de-France, celebrates every aspect of French culture with style and panache, from the excellence of its cuisine to the chic sophistication of its fine resorts and hotels. Shops, art galleries, theatres and museums all pay homage to its French heritage, and you can watch boules being played in the squares while people sit and chat outside cafés. Island hop between Petite Anse d’Arlet, the bay of Fort de France and St. Pierre, or head to Bequia, St. Lucia’s Rodney Bay and Soufrière’s waterfalls, hot springs and volcano. If you are staying longer, sail to Petit Nevis, Mustique, Mayreau, the Tobago Cays, and Union, the capital of the Grenadines. 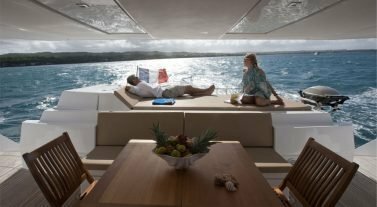 Dream Yacht Charter in Martinique: Our diverse fleet of catamarans and monohulls for bareboat yacht charters and our all-inclusive by the cabin cruises are at our base in Le Marin. The marina, set at the end of a beautiful lagoon, is just a short ride from the airport. Our Martinique base team will receive you warmly and look after you, giving local tips and advice. If you need help planning your charter, check out our inspirational itineraries section or get in touch with our team to find out more. The time difference in Martinique is Coordinated Universal Time (UTC) -4 hours. Make sure your documentation is in order to travel. 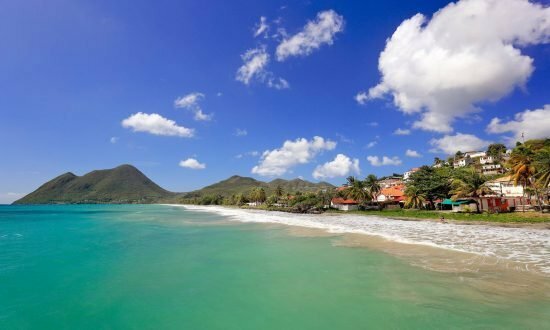 If you are staying in Martinique and the Lesser Antilles as a tourist for less than six months, you will only need a valid passport if you are from Europe or the United States. Talk to us to make sure you have the correct documents before you travel. The official language is French but many speak Creole. Taxis in Martinique run on the meter, which has a rate surcharge after 7:00pm, and they can be expensive. You can travel by bus in Fort de France cheaply. For specific information about restrictions, visit the French customs’ website. The currency in the French Lesser Antilles islands is the Euro, while it is the Eastern Caribbean Dollar for the other islands (St. Lucia and St. Vincent, etc). Master and Visa cards are accepted at our base and you’ll find an ATM in the marina where you can withdraw Euros. Banks are open Monday to Friday (8:00am to 4:00pm). You’ll find free Wi-Fi at our base. Getting online is easy with plenty of Wi-Fi spots in restaurants and cafes, but you may find that speeds vary. Temperatures in Martinique are tropical and in the 80ºFs year-round with relatively high humidity. The dry season is between December and May, while September is the wettest month. Sailing conditions in Martinique are perfect for sailors as there are north-easterly trade winds blowing most of the year. The winds are more stable in the dry season and blow steadily with moderate intensity, providing welcome relief from the humid heat. Day 1: Board for the night at Le Marin. Day 2: Sail for Petite Anse d’Arlet, passing close to the Diamond Rock. Eat lunch and go swimming, then spend your first night at the anchorage at Grande Anse d’Arlet. 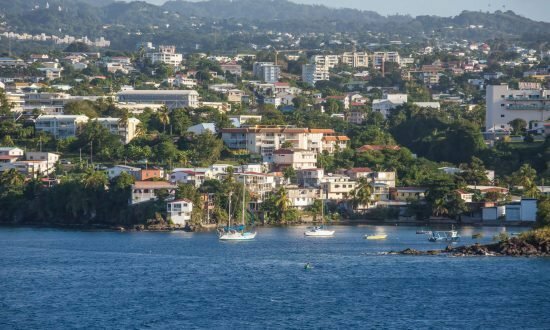 Day 3: Cross the bay of Fort de France, then sail along the Caribbean coast until St. Pierre, which is a former center of economy that was destroyed by the eruption of Mt. Pelée in 1902. Visit the museum of volcanology, then overnight in the bay of St. Pierre. Day 4: After breakfast, sail to Fort de France. Try the local restaurants and go sightseeing in the city. Spend the night at Anse Mitan in the south of the bay. Day 5: Make an early departure to sail back to Le Marin. Day 1: Board for the night at our base in Le Marin. Day 2: Provision and make the short sail to Petite Anse d’Arlet, passing close to the Diamond Rock. Eat lunch and go swimming, then spend your first night at the anchorage at Grande Anse d’Arlet. Day 3: Head to Anse Mitan, sail along the coast and pass Cap Salomon. Cross the bay of Fort de France and anchor at Fort Louis. Eat lunch ashore and enjoy sightseeing in the city. Spend the night at Anse Mitan in the south of the bay. Day 4: Leave early in the morning for Rodney Bay in St. Lucia, taking care crossing the channel. Spend the night in Marigot Bay. We recommend anchoring offshore. Day 5: Sail along the coast of St. Lucia and hop between Anse Cochon, La Soufrière and Les Deux Pitons. Day 6: Sail on and spend the night at Rodney Bay behind Pigeon Island and explore the botanical park. Day 7: Anchor outside St. Anne, a traditional village with idyllic beaches, or anchor outside Club Med. Day 8: After a last swim, cruise back to the marina. Day 2: Leave early in the morning for Rodney Bay in St. Lucia and take care crossing the channel, as it may require visual navigation. Spend the night in Marigot Bay, where anchorage off the shore is recommended. Day 3: Sail easily along the west coast of St. Lucia up to the pretty village of Soufrière. Walk through the city and the botanical garden, drive to the waterfalls, the hot springs and the volcano. Spend the night at Deux Pitons. Day 4: Take the day to cruise down to Bequia, the entrance to the Grenadines and a former whale hunters’ island. Anchor in Admiralty Bay, facing the capital city of Port Elizabeth. Celebrate happy hour and have a leisurely dinner in one of the nearby restaurants. Day 5: Once customs formalities are done, do not leave without completing this step, sail towards Petit Nevis where the fishermen used to flense the whales. Then sail to Mustique, the “Jet Set” island. Day 6: Explore Mustique in the morning. After lunch, head to Mayreau and anchor at Salt Whistle Bay, a calming beach with swaying coconut trees. Day 7: Cruise toward the renowned Tobago Cays, an itinerary highlight. With their glittering cobalt waters and white sand beaches, this location is ideal for snorkeling, swimming and relaxing. Day 8: After about an hour of sailing, stop over at Union, the capital of the Grenadines. Spend the night on Palm Island. Day 9: Cruise to St. Vincent and anchor for the night at Cumberland Bay or Wallilabou Bay, where the movie “The Pirates of the Caribbean” was filmed. Day 10: Make your last long sail towards Martinique, anchoring at St. Anne or at Club Med. Day 11: Make you way back to base at Le Marin. Day 1: Le Marin – board for the night. Day 2: Cruise towards the nearby Anse d’Arlet, and spend your first night at the anchorage. Day 3: Leave early in the morning for Rodney Bay in St. Lucia, where you can go for a dip and grab lunch on the island. Crossing the channel may require visual navigation, so keep a lookout. Spend the night in Marigot Bay, where anchorage offshore is recommended. Day 4: Sail easily along the West coast of St. Lucia up to Soufrière, a picturesque village. Walk through the city and the botanical garden, drive to the waterfalls, the hot springs, and the volcano. Spend the night at Deux Pitons. Day 5: Take the day to cruise down to Bequia. Bequia, entrance to the Grenadines, is a former whale hunters’ island. Anchor in Admiralty Bay, facing the capital city of Port Elizabeth. Celebrate happy hour and have a leisurely dinner in one of the nearby restaurants. Day 6: Once customs formalities are done, sail towards Petit Nevis where fishermen used to flense the whales. Then sail to Mustique, the “Jet Set” island. Day 7: Explore Mustique in the morning. After lunch, head to Mayreau and anchor at Salt Whistle Bay, a calming beach with swaying coconut trees. Day 8: Cruise toward the Tobago Cays. With their turquoise waters and white sand beaches, they’re ideal for snorkeling, swimming, and relaxing. Day 9: After about an hour of sailing, stop over at Union, the capital of the Grenadines. Spend the night on Palm Island. Day 10: Pass by Morpion, a little sandy island in the middle of the reef, and anchor at Petit St. Vincent. This resort island is the perfect spot for a sunset drink. Day 11: After breakfast, head to Canouan via Chatham Bay, a large natural bay west of Union. Spend the night anchored at Charleston. Day 12: Cruise to St. Vincent and anchor for the night at Cumberland Bay or Wallilabou Bay, where the movie “The Pirates of the Caribbean” was filmed. Day 13: Spend your last long navigation day cruising to the north of St. Lucia. Anchor overnight at Rodney Bay behind Pigeon Island and visit the botanical park if you have time. Day 14: Anchor outside St. Anne village or Club Med. Day 15: After a swim, head back to the marina to disembark. Day 2: Navigate towards Petite Anse d’Arlet, passing close to the Diamond Rock, and eat lunch and go for a swim. Spend your first night at the anchorage at Grande Anse d’Arlet. Day 3: Sail toward Fort de France and eat lunch ashore. Visit the town, shops and local market before crossing the bay to spend the night at Anse Mitan. Day 4: Spend the evening in the bay of St. Pierre. Day 5: Set sail early for Portsmouth, Prince Rupert Bay, and visit the Indians River with local guides. Spend the night in the anchorage. Day 6: After a sail from Portsmouth to Les Saintes, anchor at Pain de Sucre for snorkeling. Anchor for the night in front of Bourg des Saintes and have dinner ashore. Day 7: Set sail for Pigeon Island and pick up a mooring to visit the famous Jacques Cousteau underwater marine park. After snorkeling or diving, sail to Anse Deshayes for overnight anchorage. Day 8: Depart early morning for Antigua’s English Harbour. Take a walk among the beautifully restored houses and visit the museum. There are plenty of opportunities for provisioning ashore. Day 9: Make a short sail along the west coast to Cade Reef, where you can snorkel magnificent coral and eat lunch anchored in Fries Bay. Enjoy a swim, relax and sail to the anchorage at Five Islands Harbor. Spend the night here. Day 10: Sail to Barbuda, a fabulous coral island with miles of sandy beach. Anchor at Codrington, in front of the impressive stretch of white sand. Eat lunch, swim, snorkel and stroll along the long deserted shore. 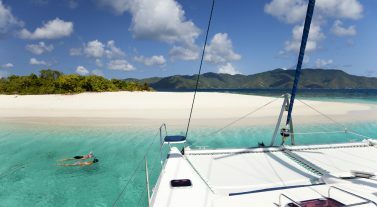 Day 11: Depart early morning for Nonsuch Bay, a small bay on the east coast of Antigua, which is wild and captivating. Sail behind Green Island. Day 12: Depart early for Ilet Gosier, on the east side of Guadeloupe to enjoy the white sand beach and nearby coral reef. Day 13: Set sail in the morning for Marie-Galante, where the sugar-centered history of Guadeloupe’s Archipelago lingers. Day 14: Leave Marie-Galante early in the morning for your last long cruise. 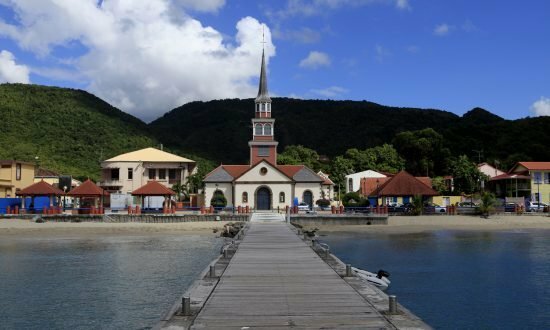 Sail to Martinique for lunch in Grande Anse d’Arlet before making your way to St. Anne, a charming village with boutiques, a delightful fishing community and local market. Day 15: After a swim, head back to base to disembark. Day 1: Le Marin – Boarding for the night. Day 2: Sail towards Anse d’Arlet and spend your first night at the anchorage. Day 3: Leave early in the morning for Rodney Bay in St. Lucia, where you can go for a dip and grab lunch on the island. Crossing the channel may require visual navigation. Spend the night in Marigot Bay and anchor offshore. Day 4: Sail easily along the west coast of St. Lucia up to Soufrière, a village worth a visit. Walk through the city and the botanical garden, drive to the waterfalls, hot springs and the volcano. Spend the night at Deux Pitons. Day 5: Set sail early to reach Petit Byahaut in St. Vincent for lunch and snorkeling. Pick up a mooring ball at Young Island for the night. Day 6: Take the day to cruise down to Bequia, entrance to the Grenadines, a former whale hunters’ island. Anchor in Admiralty Bay, facing the capital city of Port Elizabeth, and celebrate happy hour or have a leisurely dinner in one of the nearby restaurants. Day 7: Once customs formalities are done, sail towards Petit Nevis where the fishermen used to flense the whales. Then sail to Mustique, the “Jet Set” island. Day 8: Early in the morning, tour Mustique’s beaches and villas. After lunch, head to Mayreau and anchor at Salt Whistle Bay, a calming beach with swaying coconut trees. 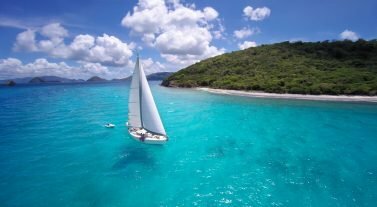 Day 9: Cruise toward the Tobago Cays. With their turquoise waters and white sand beaches, they’re ideal for snorkeling, swimming and relaxing. Day 10: After about an hour of sailing, stop over at Union, the capital of the Grenadines. Spend the night on Palm Island. Day 11: Pass by Morpion, a little sandy island in the middle of the reef, and anchor at Petit St. Vincent. This resort island is the perfect spot for a sunset drink. Day 12: Sail between Morpion and Punaise then to Hillsborough. From here, you’ll be at Sandy Island in no time, where you can anchor off the beach for the night. Day 13: After breakfast, sail to St. George’s, hugging Grenada’s west coast, and anchor in the harbor. Stroll through this stunning Caribbean metropolis, stopping for a leisurely dinner. Day 14: Head to Edgmont, as the large and quiet bays in the middle of the rainforest on the south coast make it a true paradise. Day 15: Prickly Bay became a yachting center of Grenada because of its marina and the most beautiful sailing boat in all the Caribbean. Choose one of the many restaurants ashore for your dinner. Day 16: On the way to Carriacou, stop for lunch at Isle Ronde. Take advantage of the perfectly clear water for snorkeling. Then sail on to Tyrell Bay. Day 17: Before leaving Carriacou, stop at customs in Hillsborough to check out, then sail on to Union and check in. Anchor at Palm Island in front of the perfect palm-lined beach. Day 18: After breakfast, head to Canouan via Chatham Bay, a large natural bay west of Union. Then spend the night in Charleston Bay. Day 19: Cruise to St. Vincent and anchor for the night at Cumberland Bay or Wallilabou Bay, where the movie “The Pirates of the Caribbean” was filmed. Day 20: Spend your last long navigation day cruising to the north of St. Lucia. Anchor overnight at Rodney Bay behind Pigeon Island and visit the botanical park if you have time. Day 21: Arrive at Martinique after the final leg of your journey. Anchor outside St. Anne village or Club Med. Day 22: Head back to Le Marin to disembark. 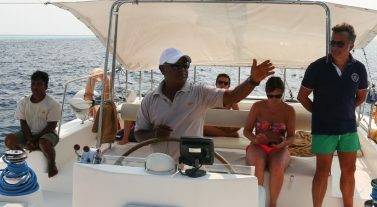 Our Martinique Base Manager, (martinique@dreamyachtcharter.com) will be pleased to welcome you on arrival at Le Marin. The base is open 8:30am to 5:30pm. The Dream Yacht Charter base at Le Marin is set at the end of a beautiful lagoon. It includes all the facilities any sailor could need: well-stocked chandleries, a supermarket, and restaurants. The marina at Le Marin is one of the largest in the Caribbean that caters specifically to pleasure boats, and is just a day’s sail from the Grenadines. 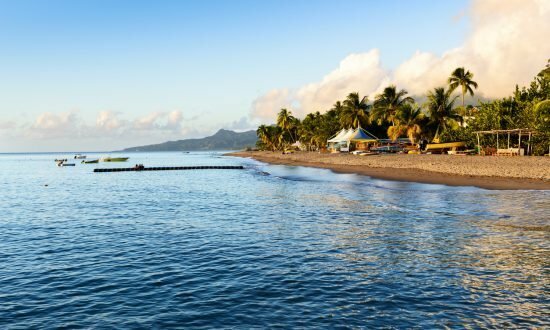 Fly to Martinique Aimé Césaire International Airport (FDF), Fort-de France, from Miami or Fort Lauderdale (3 hours 45 minutes) with American Airlines and New York JFK or Providence TF Green PVD (4 hours 25 minutes) with Norwegian Air International. We can arrange airport transfers on request to our marina, which takes about 40 minutes by taxi. Make sure your passport is in date and valid for the duration of your stay and we’ve got visa advice under our Handy Info section. Météo France forecast is posted at the harbor master’s office and Total gas station at 8:30am. Special announcements are issued in case of hurricane warnings or tropical waves. Marine weather forecast is broadcasted every morning at 6:25am on RFO Martinique 13.10 Khz in MA and 92-93.2-94-94.3-94.5-96.5-97.5 Mhz in MF. There are plenty of provisioning options with a local Carrefour 3km from base (free shuttle), Leader Price 3km from base and Simply Market, just 150m from base. Supermarkets are open Monday to Saturday 8:00am to 8:00pm and on Sunday 8:00am to 12:00pm. We recommend you provision in advance so that your supplies are ready for your arrival. Just fill in the forms in our Useful Downloads section.